Fight back with COLOSTRUM PLUS. Environmental and physical stress, age and our modern diet tax your immune defense system. Rebuild and promote an improved wellbeing with COLOSTRUM PLUS™. 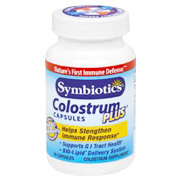 The immune factors and antibodies, naturally contained in Colostrum, help you maintain a strong and balanced immune defense with dual action in the bloodstream and digestive tract- where your need for immune defense may be greatest. Creating a robust intestinal lining and a balanced digestive flora, are keys to good health. Be at your best with COLOSTRUM PLUS. Enhance your athletic performance and recovery with growth factors that support strength and stamina while promoting the normal re-growth of lean muscles. Colostrum and Proline-rich polypeptides naturally found in Colostrum are backed by numerous scientific studies with a wide array of health benefits demonstrating the superiority of Colostrum Plus. Have confidence with COLOSTRUM PLUS. Symbiotics guarantees minimums of 1.5% Lactoferrin (14mg), 25% Immunoglobulins (240mg IG) and 3% Proline-Rich Polypeptides (29mg PRP), Colostrum’s most important component. Our unique BIO-Lipid™ coating insures the availability of the powerful nutrients in Colostrum. Without this protection, other Colostrum products are destroyed by stomach acid and provide reduced benefits. Colostrum Plus comes from USDA Grade A dairies that are hormone, pesticide, antibiotic and rBST free. Symbiotics uses only the first 2 milkings to guarantee potency and quality. Colostrum Plus® comes from USDA Grade A dairies that are hormone, pesticide, antibiotic and rBST free. We use only the first 2 milkings to guarantee potency and quality. If you’re not satisfied, just mail in your bottle and cash register receipt for a full purchase price refund. Colostrum Plus - is shipped in a discrete, unmarked package. Orders are processed immediately and usually take about 3 to 5 working days to be received. We do ask that you try it for 2 to 3 weeks to feel the full effects. Any information received is used only for order processing and shipping purposes. Your information, such as e-mail address, will never be disclosed to a third party.